Join us for our monthly featured author/open mike series that happens every 4th Tuesday of the month. This month our featured author is Norbert Krapf, former Indiana Poet Laureate. 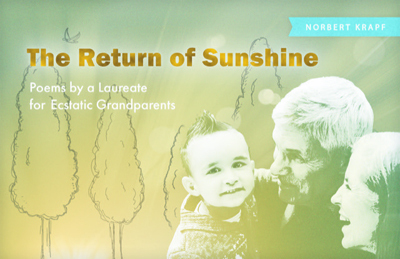 Norbert will read from his twelfth poetry collection, The Return of Sunshine: Poems by a Laureate for Ecstatic Grandparents, about his Colombian-German-American grandson. He will read poems dealing with Peyton’s multicultural heritage, his evolving skills in speaking English and German, and spending time with his grandson in his outdoor kindergarten deep in the woods near Regensburg, Germany. Norbert received the Lucille Medwick Memorial Award from the Poetry Society of America, a Glick Indiana Author Award, and a Creative Renewal Fellowship from the Arts Council of Indianapolis to combine Poetry and the blues. He released a poetry and jazz cd with pianist-composer Monika Herzig, Imagine, and combines poetry and the blues with bluesman Gordon Bonham. He taught American Poetry as a Fulbright Fellow at the Universities of Freiburg and Erlangen-Nuremberg in Germany and is an emeritus professor of English at Long Island University, where he directed the C.W. Post Poetry Center. Norbert is completing an adaptation of his poetry collection Catholic Boy Blues into a play with music. 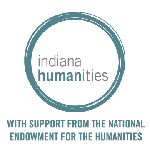 Indiana Humanities, in partnership with Brick Street Poetry and the Indianapolis Public Library, are excited to welcome U.S. 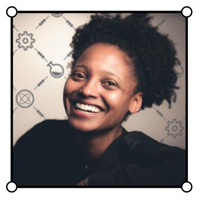 Poet Laureate Tracy K. Smith to Indiana for a poetry tour from November 27 to November 29. The events will be held in Greencastle, Hanover, Indianapolis and Shelbyville and will be free and open to the public. However, advance tickets are required and seating is limited. The tour will serve as the closing program for Indiana Humanities’ two-year thematic initiative called Quantum Leap which explores the spirit of possibility and problem solving that happens when we bridge the STEM (science, technology, engineering and math) fields with the humanities (poetry, literature, history, philosophy, religion, world languages and culture, etc.). Smith, whose book of poetry Life on Mars won the Pulitzer Prize for poetry in 2011, was in part inspired by her father’s work as an engineer for the Hubble Space Telescope and includes science fiction and cosmic themes. Doors open at 7 p.m. and a book signing will follow (a limited number of books will be available for purchase). Smith will be joined by Dr. Dee Goertz of Hanover College for the conversation. Doors open at 7 p.m. and a book signing will follow (a limited number of books will be available for purchase). Smith will be joined by Dr. Joseph Heithaus of DePauw University for the conversation. Smith will be joined by Indiana Poet Laureate Adrian Matejka. Matejka, who grew up in Indianapolis and now teaches at Indiana University, has also written about space themes in his critically acclaimed book of poetry Map to the Stars. The INconversation will be held in the Clowes Auditorium at the Central Library. Doors open at 6 p.m. and a book signing will follow (a limited number of both Smith's and Matejka's books will be available for purchase). 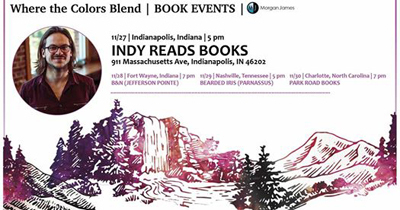 Come hang out at my favorite bookstore in Indianapolis on the RELEASE DATE of my first book in my own voice, "Where the Colors Blend: An Authentic Journey through Spiritual Doubt and Despair ... and a Beautiful Arrival at Hope." I'm excited to come home to the state where this journey began! Swing by to get a copy for the first time, discuss themes from the book like doubt, spirituality, and suffering, or simply hang out and re-connect. This book might also make for a good Christmas gift for anyone who is questioning their faith, needs some inspiration, or feels alone in their suffering. We'll be continuing the conversation after the event at St. Joseph's Brewery down the street. I can't wait to see you at Indy Reads Books! Stephen's present-tense narrative, mysteriously unfolding all the way, is free-thinking and free-flowing, swinging from humor to complex theology, from someone else's story to sudden introspectiveness and application, creating a unique experience for readers as it challenges them to adopt their own lifestyle of introspection and contemplation. Thursday, November 29 at 7:30 p.m.
Krannert Auditorium, Room 140, on the Purdue campus. Natalie Diaz was born and raised in the Fort Mojave Indian Village in Needles, California, on the banks of the Colorado River. She is Mojave and an enrolled member of the Gila River Indian Tribe. Her first poetry collection, When My Brother Was an Aztec, was published by Copper Canyon Press. She is a MacArthur Fellow, a Lannan Literary Fellow, and a Native Arts Council Foundation Artist Fellow. She was awarded a Bread Loaf Fellowship, the Holmes National Poetry Prize, a Hodder Fellowship, a PEN/Civitella Ranieri Foundation Residency, as well as being awarded a US Artists Ford Fellowship. She teaches at the Arizona State University Creative Writing MFA program. Q&A to be held in BRNG 2290 at 4:30pm. Event sponsors include the Purdue Native American Educational and Cultural Center and the Purdue LGBTQ Center. This event is free and open to the public. Dr Hana Morgenstern is a scholar, writer and translator. She is University Lecturer in Postcolonial and Middle East Literature at Cambridge University and a Senior Fellow at Newnham College. Dr Morgenstern is co-director of the Documents of the Arab Left Project. She is currently at work on a book manuscript titled, A Literature for All Its Citizens: Aesthetics of Coexistence in Israel/Palestine. Grab a drink at the bar and start your holiday shopping early at this beautiful, historic mansion elegantly decorated for the season. Come discover titles for all ages and interests by local authors and get your books signed and personalized! What better gift for the readers in your life? A signed book is a one-of-a-kind gift! Author Fair has something for everyone on your shopping list – and for you, too! More than 70 Indiana authors will pack the William H. Smith Memorial Libray for this fun-filled day of mixing, mingling and book signing. Book topics range from sports and biographies to youth historical fiction and politics and more. Meet your favorite local authors such as basketball star and Olympic athlete Tamika Catchings, Philip Gulley, and James Alexander Thom and Dark Rain Thom. This year, meet 8-year-old author Samiah Turner and pick up a copy of her book, My Life as an 8 Year Old Engineer, to inspire the child in your life. Author Fair is a day of fun for all ages. Join in the Festival of Trees fun, including photos and storytime with Santa and book-themed crafts for kids and kids at heart. Be sure to enter to win an Author Fair gift basket, too! Free admission includes the Indiana Experience and Festival of Trees. Complimentary parking is available on a first-come, first-served basis. Bill Breeden is a native Hoosier born and reared about five miles east of Odon near theborder of the Naval Surface Warfare Center locally known as Crane. He is one half of the third and last set of twins his mother bore along with scattered singles or “spares” as his Pappy called them. He began preaching at the age of fifteen in tent revivals, and holiness meetings. His religious beliefs have changed over the years, and taken him from the sawdust trails to several jails for acts of civil disobedience. He holds a Bachelor of Arts in Religion and Philosophy and an Master of Divinity in the same. He also did graduate work at IU in Criminal Justice. Bill is a retired Unitarian Universalist Minister, an agnostic and hell-raiser. He is continuing to work on his memoirs, entitled “Billy Pilgrim and the Black Female Jesus.” It has consumed much more time than he expected, and hopefully will consume less time than he has. He lives in Owen County with Glenda, his partner of nigh on to fifty years, and Obi, the best dog in the world. Antonia Matthew, born in England, grew up there during WWII. 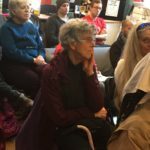 She has been in Bloomington since 1968, is a member of Five Women Poets, a writing group that has been going since 1974. They have put out three chapbooks, a Renga poem and a cd. She has been a member of the Writers Guild since the beginning. She mostly writes poetry but is also writing memoir, and has a short play Home Front which will be staged by the Writers Guild sometime in 2019. 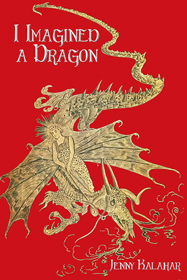 We can only guess what intriguing thoughts Jenny will share with us as she reads from her book "I Imagined a Dragon", but we know Jenny's keen wit and imagination will take us on a literary adventure. Bring the kids, bring grandma, Jenny's writing entertains all ages. Jenny Kalahar is a used & rare bookseller in Elwood with her husband, Patrick. She is the author of Shelve Under C, The FInd of a Lifetime, Bindings, This Peculiar Magic, One Mile North of Normal, I Imagined a Dragon, All the Dear Beasties, and The Soggy Doggy. These are four novels, a collection of poetry, a children's story/poetry book, an anthology of magazine columns, and a children's picture book. 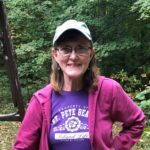 Jenny is on the executive board of the Poetry Society of Indiana and is their publisher, she helms Last Stanza Poetry Association and has begun work as the president of the Youth Poetry Society of Indiana. She is taking submissions for an anthology of Indiana poets age 12 to 18 that will be published early in 2019 as a joint project of PSI and YPSI. She was nominated for a Pushcart Prize in poetry. Jenny has been published in the National Federation of State Poetry Societies' annual prize-winning anthology, Encore, in The Poets of Madison County, Words and Other Wild Things, The Polk Street Review, Bards Against Hunger, Diamonds, Indiana Voice Journal, Tipton Poetry Journal, Trillium, in newspapers, and her radio play was performed and broadcast in Michigan. 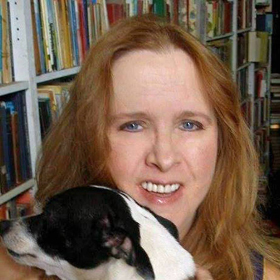 She has been a proofreader for a publishing company, has owned and operated bookshops in Michigan and Ohio with Patrick, and is the humor columnist for Tails Magazine.